This year of 2018 has brought some changes. I have shifted my art practice from creating Every Day art series to EcoMemory commission art for clients. I also did not participate in the 100 Day challenge after completing the challenge the past three years (and even continuing in between). I miss the past daily rituals in the studio but I love the interaction with my clients, discussing their memories of their favorite places in nature, and creating art to reflect those memories. As I look back at the 100 day projects, I am reminded of the amount of focus and hard work needed to pull it off. Here is the original article I wrote about 2017’s 100 Day Project. In the past two 100 Day Projects, I have created a four part series around a theme. In 2016, my theme was the Four Elements. I created a 25 day piece sewing together 25 daily squares for each of the elements; Fire, Sky, Water and Earth. This year's theme was Trees and Windows. Since I just finished the 100 Day Project last week, I decided to give some insight into my creative process by sharing, and maybe rambling a bit, about what I was thinking for each piece in this four part series. This year I was inspired by the art of Elizabeth Gourlay. 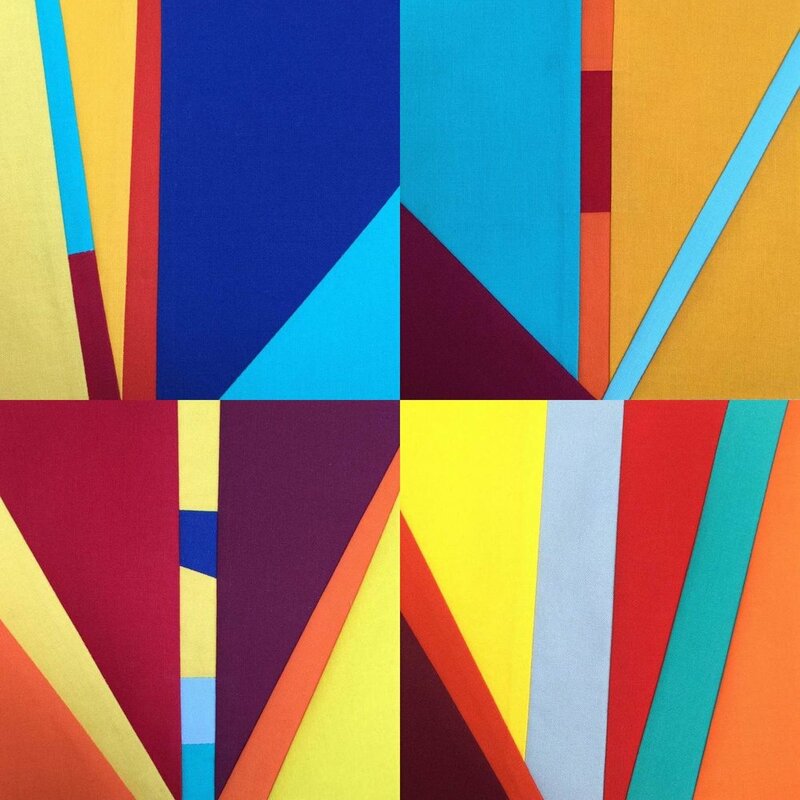 In particular, I was drawn to her geometric art with color strips around the outside of a square and pieces with vertical and horizontal lines made up of small strips of color within the line. I envisioned the vertical strips as trees and the square piece as a window frame. Hence the name of the series is Trees and Windows. I knew I could have these two pieces compliment each other with the design. For the other two pieces in the series, I thought I could just reverse the design concept and call them Inverse Trees and Inverse Windows. Instead of color strips on the edges of a square like a window frame, the second piece would be full of color strips on the inside of the window and then grey as the window frame. 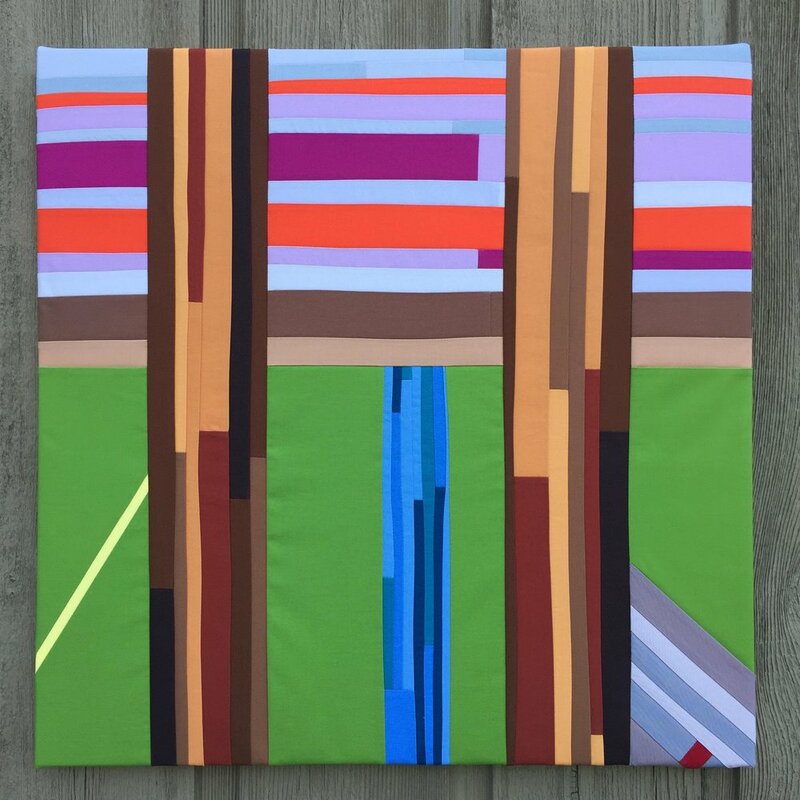 For the tree series, the inverse would be a grey vertical strip amongst strips of fabric as the background. The color palette for the entire series is a play between warm and cool colors. The Trees and Inverse Trees series use cool colors like blue, green and purple in varied color intensities. I added in a very light green color to contrast with the dark grey background. These light green pieces really stand out and I am glad I added them. To vary the design, I used different widths for the trees for the straight lines. Later in the series, I decided to deviate from straight lines because when I thought of real trees, they are rarely straight. I added in some conical shaped trees. The different grays for the background give an added texture like varying shades due to sun filtering through the trees. The neutral grays are darker in the Tree series. For contrast I used lighter grays for the Inverse Trees. I was looking for more contrast so the trees would really stand out in the Inverse Trees series against the bold colors in the striped sections..
For the Windows series, I used a wide range of warm colors like yellow, orange, and red in various intensities. I used different size rectangles and squares in warm colors surrounding the gray square. Things got really chaotic in the Windows series. And I really like it. One of my favorite ways to work is piecing intricate designs which radiate lots of movement even in a small 6 inch square. 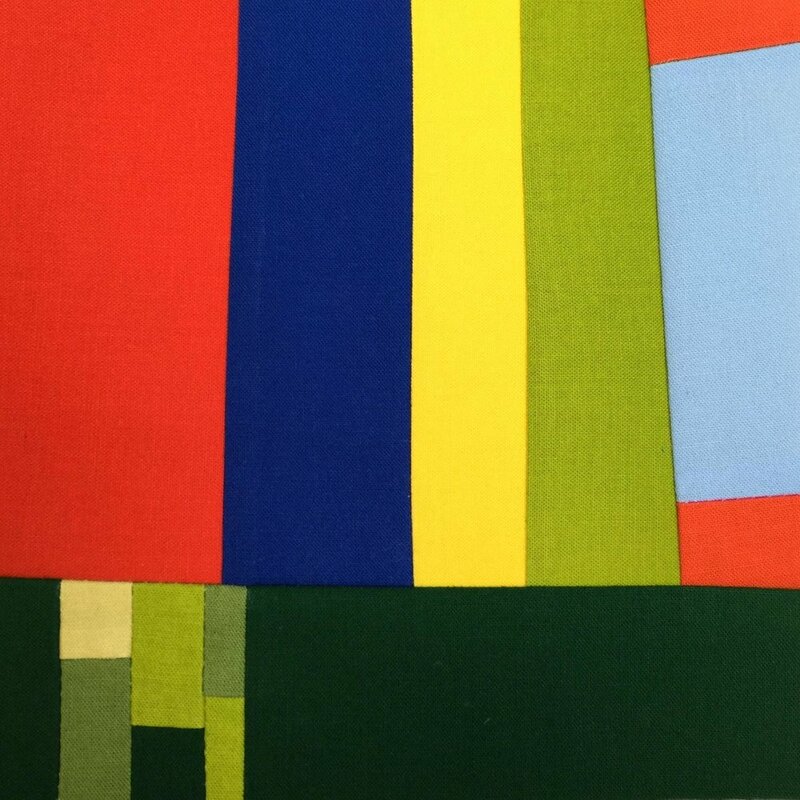 Then when these 6 inch squares are lined up in 5 rows or 5 squares, there is an explosion of color and movement. I have always been partial to the cool colors of green blues and purples. However, this Windows piece has helped me see the value of warm colors. Now I can say I like all colors, even pink. I used pink in the Inverse Windows piece because I envisioned the striped internal square to be a view from a window looking out at the sunrise or sunset. I relented and decided to use some pink to make it look more like a sunrise. The medium bright pink added a good contrast with some of the darker purples and reds. The Inverse Windows piece reminds me of 25 small Mark Rothko type of images. I tried to keep the striped inner squares simple and horizontal. But I couldn't help but add some angled stripes and then I couldn't help but add some more complicated designs in the last two rows. In other past series as a nod to my favorite way to design with intricate interlocking small pieces, I save the most complicated design for the last square, which is the one in the last row on the right corner. If you look at each 25 day piece in the lower right, you will see that I try to outdo myself each time on the final square and challenge myself to make something totally different than all the previous 24 squares. The Inverse Windows' last square includes my favorite purple fabric as a mini frame around an intricately pieced square as a fitting conclusion to this fun Four Part series, Trees and Windows. Fractured Blue Sky No. 2. Even though I am on a summer hiatus from making daily art, I still daydream about different series ideas or jot down ideas like “dappled sun among leaves.” You really can’t just turn off your imagination. There are certain people I have followed for years listening to or reading anything they create. Jonathan Fields is one of those people. Twyla Tharp is another. Here is the original article I wrote about Jonathan Fields and Twyla Tharp. There is a huge uncertainty in the life of someone who wants to create. And let's face it. As I said several years ago in the quote above, all of us are creators. As an artist, you're constantly asking what now? The daily practice foundation can gently encourage you or it can drag you kicking and screaming to get to the studio to create, to the desk to write, to the chair to knit, to the park to photograph. You do it because you told yourself you would do it. As I showcase my past Every Day Project series, I wanted to include all the projects I created during the 100 day Projects I participated in over the years. 2016 was the year I did the Four Elements: Sky, Water, Earth and Fire. I displayed these four pieces in the Abstract Ecology show I did with my talented daughter Maggie @maggiewarrenstudio. Read HERE to learn more about it and HERE where we interview each other about the show. I turned this series into two medium size artworks wrapped around a canvas. I used 12 daily squares in each piece. This design looked a little boring in the photos of the daily squares I posted on Instagram. But when I sewed them together for these 2 pieces, WHAM. They look awesome together. They would go great with mid century modern design or good old IKEA furniture. I think it is the typical Swedish blue of a lot of IKEA furniture that makes me feel this way. They are available for sale on my website HERE AND HERE. They look like tumbling boulders running down a hill to me. I wrote an article about my original inspiration. My next series, Four Corners, is loosely based on a painting I saw by Helen Frankenthaler. 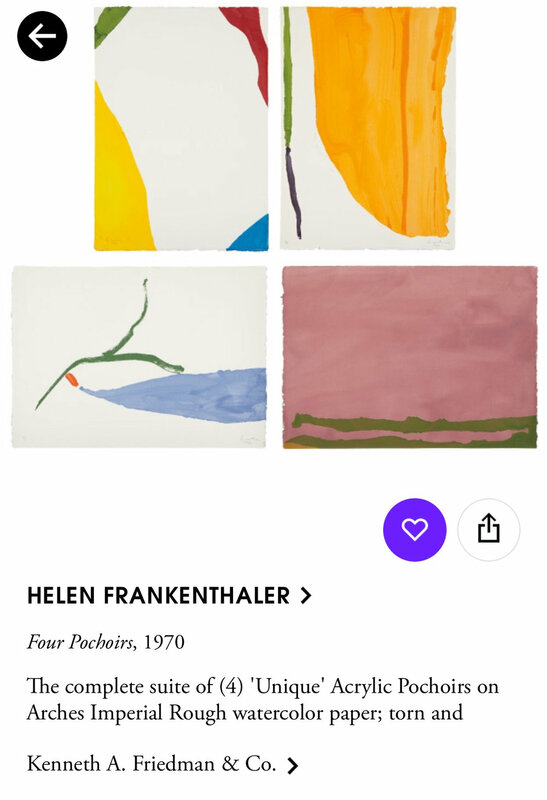 My Instagram friend Brianne of @briannealves posted about Helen Frankenthaler last year and I have been hooked ever since. I have decided that whenever somebody mentions an artist I'm not familiar with, it's in my best interest to check that artist out. In this case, Brianne has a fantastic sense of color and design and I've been following her since I started the 100 day project in April 2015. We share a love of the color blue. So I knew I would most likely be fascinated by Frankenthaler's art. I've read a few books from my local library on Helen Frankenthaler. She started the influential color stain technique where she poured thinned out paint onto an unprimed canvas. For some reason, she is not as well know as her husband of 13 years, modern artist Robert Motherwell. I have included her biography from the Artsy site. I wanted to see more of her art than I found at the library. One way I look for well reproduced photos of art online is on the website Artsy. You can follow artists and even see some pieces for sale at galleries. There's a short biography of each artist. It's a great way to noodle around looking for inspiration for colors or designs and learn about art history and contemporary art. Now as I've said before this is not about copying somebody else's Art. This is about looking for things that trigger an interest in you. By way of example, I've included the Frankenthaler paintingthat was my starting point for my next series. Here is a run down of my thinking process. 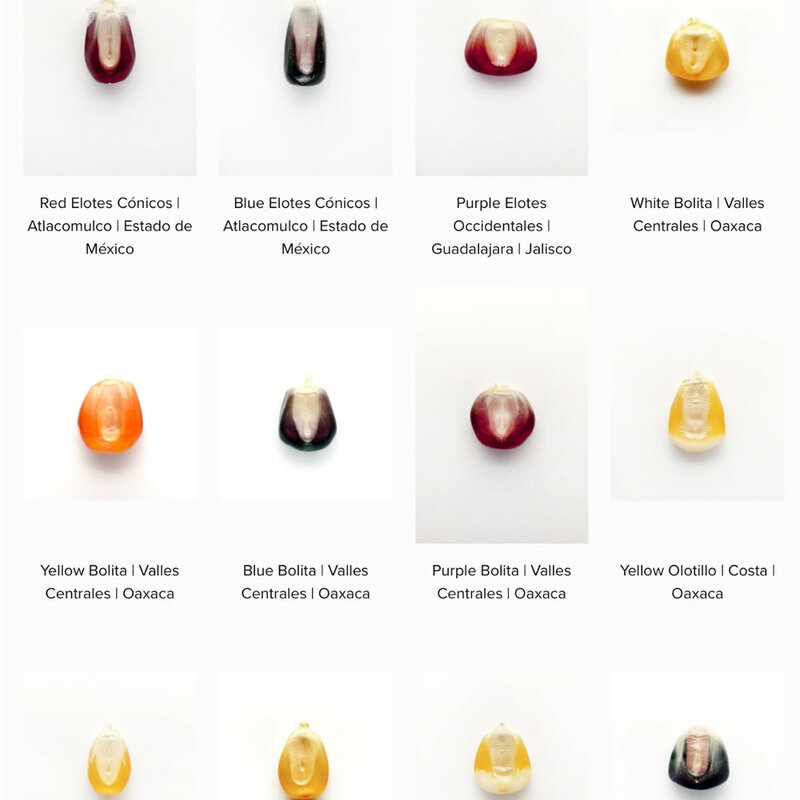 The photo shows the Four Pochoirs for sale on Artsy. The one that inspired me is on the upper left and is called Wind Directions. As I thought about my next series and looked at Wind Directions, I decided I wanted to modify all the colors. I didn't want a white background. As I said, one of my favorite colors is blue so I'm mixing in many different blues as the main color for the background. As for the design, I love Frankenthaler's attention to only the corners. Ironically, the third quilt I ever made was based on a traditional pattern called Snowball. The design is only remotely similar. The traditional Snowball is a little uptight with consistent triangle corner shapes and usually the same color triangles in the corners. Frankenthaler's painting is a wild child with each corner being a different color and shape, and is not related at all to the other corners. My idea for the design for my next series Four Corners is to pick a color palette with enough variety to make the color interesting, similar to Frankenthaler. I want to "up the contrast" with the blue center and will use oranges, lime green and lemon yellow (think Mike and Ike candy colors). Of course, I want to make each square visually interesting by having different shapes in each corner. Different shapes. Different colors. I'm looking for something much more free-form than the traditional Snowball. You need some constraints and some freedom. You need a structure to get you started. You need flexibility and a sense of play to want to keep doing it. I feel this will be a perfect balance of those parameters in my next series. I spent a week in New York City this month. The topic of Authenticity vs. Influences was something on my mind as I saw original artworks by some of my art heroes. I saw a piece by Helen Frankenthaler, several Cezanne's and Berthe Morisot's. Frankly, I am still processing all the art we saw in just three museums in New York City. I have been thinking about how to incorporate the art that inspired me into my own style of art. Still a work in progress. Here is my original article. Sometimes this is easier said than done. Why? I do not know. Because being yourself seems like it should be the easiest thing in the world. Authenticity applies to all aspects of our lives. How you live your life, your career, hobbies, food you eat, etc. In the creative world, many artists go through phases where they're a little "too attached" to their influences. I know I have. My son pointed out to me that on one of the band Cream's songs, Eric Clapton mimicked an Albert King guitar riff note-for-note. This does not mean he was plagiarizing him. But Albert King is one of his influences.Clapton listened to all the early blues and rock musicians. Even as accomplished as Eric Clapton was and is, his influences came through. Eric Clapton's guitar playing has such an authentic sound, I can tell it is him playing with just a few notes into a song. The Gulf Waters series may be one of my favorites. I love all the blues. It was effortless to make. We were on vacation with our children in Florida and I still remember each of my sons picked out the colors and designs for a daily square. I liked how I documented my inspiration from one thing to another that just takes one second but much longer to write about. As I said, everything seemed effortless. The idea for the Gulf Waters series started with a black and white junco bird outside my window in our redbud tree in March 2016. I always imagine these birds as little nuns in black and white habits. The idea came to me to make a quilt in all black and white. My immediate concern was that I did not have enough solid black fabric. Ok . Improvise. I could expand out to grey along with the black and white. Then I realized I have loads of bright blues like Caribbean water colors. I decide to switch to blues and greys as my color palette. This is perfect since I was going to be spending time on the Gulf of Mexico in March. Hence the name of the series, Gulf Waters. Things were starting to fall into place. Next idea, I needed some color accents in each square. The question is, should I use the same color in each square or the same color family, or totally random. Hmmm. I decided on Kona cotton tomato red to contrast with the bright blues. I have always loved turquoise blue and bright red together as a color combination. Since I was in Florida for Spring Break during this 25 days, I needed a project that I could easily hand sew with some precut strips of fabric to sew together. This meant long strips and big squares as part of the design since they would be easier to hand sew. When I travel, I bring a small sewing case for a few needles, thread and a small embroidery-size scissors along with a variety of precut fabric strips in my color palette for the series. I use a lot of bias fabric which is cut diagonally across the fabric grain and can be stretchy. To stabilize my squares, I use a piece of thin cotton as a foundation fabric. I have used Ikea sheets cut into 7 inch squares in the past. It becomes my canvas where I lay out the fabric before I start sewing to see how the design will look. I audition the fabric choices for both color placement and the over all design. When I am satisfied, I start to sew the piece of fabric onto the foundation fabric by machine or hand sewing if I am not near my sewing machine. I keep sewing until I am done and the 7 inch white square is fully covered with fabric. Lastly, I use my 6.5” acrylic square ruler and a rotary cutter to cut the square down to this consistent size. Days 76-100, Gulf Waters, 2016. In this case, this series started with the color palette. Once I knew what fabric to use, I turned to the design. Now for the design decision. In 2015, I was inspired by aboriginal artist Emily Kame Kngwarreye’s art to make the piece titled, Homage to Emily. I used one of her classic designs and added a color palette from one of her other works depicting colors of her native Australia, reds, oranges, and magenta. I thought this design would be perfect for the hand sewing portion of this Gulf Waters series. Not one to do the same thing twice, I decided to make some slight modifications. The lines would be vertical instead of horizontal. In addition some the same strips would have two or three colors instead of just one color. This adds quite a bit of complexity into the design. I just completed quilting Gulf Waters. I love the red H in the middle of the quilt. The utter randomness of all the lines really speaks to me. I never know how all of the daily squares will look together except in my imagination. This piece exceeds my expectations. I used light grey thread to quilt all three layers of the quilt top, cotton batting, and backing fabric. The grey thread weaves in through the design vertically just like the fabric strips. 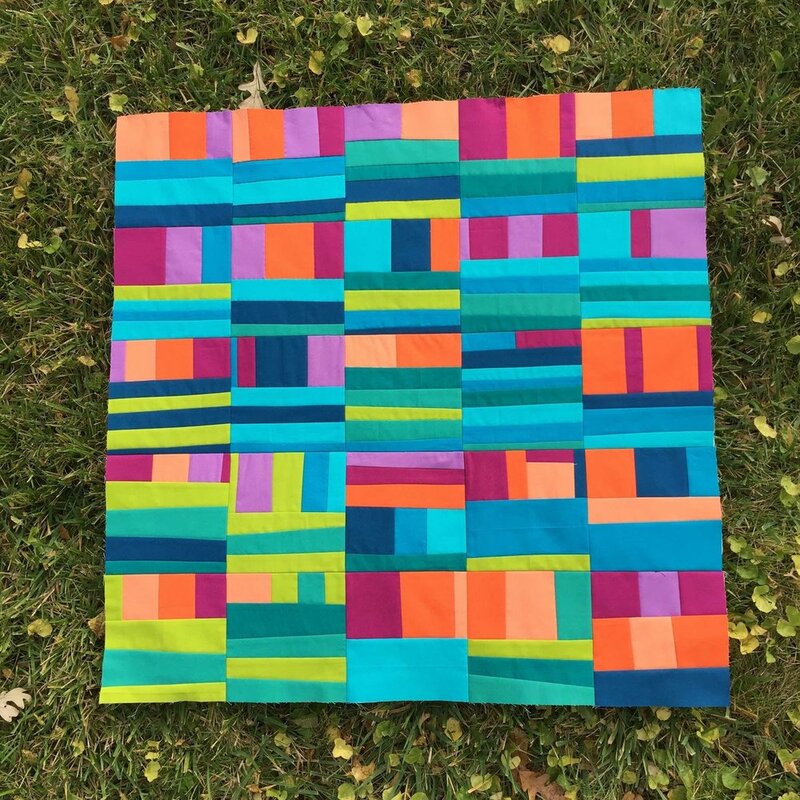 For complicated designs like Gulf Waters, I try to keep the quilting lines simple and minimal to let the colors of the quilt top really stand out on their own. The finished quilt is 30 inches square. I am continuing to catch up on the quilting of all the daily squares and will post them on Instagram as I finish them. After making many 25 Day series projects for almost 3 years, I have learned some things about how to keep creating art on a regular basis interesting for me. My goal is to have little or no resistance to get into the studio. The idea of some rules (constraint) and some flexibility (freedom) is a concept that works for me as a balancing act to make creating fun without overwhelm. Here is an article I wrote about it. I wrote this article in March 2016. It is still one of my all-time favorites. I truly believe +creativity -stress. If I did have a cause, this would be it: to help people see the benefits of a creative practice, of any size. The benefit is in the doing. Here is the original article. Maybe you have heard of the term creative flow. It is when you are so immersed in the creative act that you experience a sense of flow where you are totally in the moment and the ideas appear almost effortlessly one after another. You feel so absorbed in the task that you lose a sense of time and place. It would take a fire alarm to drag you away from your activity. This is one of those things that you just know it when you're in it. I know what it feels like and tweak the conditions to get there regularly through my creative habits. Of course, some days your creative pursuit does not feel so flowy. That is OK. I keep it short on those days. But I still am in the studio. I never just give up. I may make something I am not happy with, but I just show up.